So many times I have thought – damn I could make a sweet short film that could lead onto greatness. But figured screw it, I haven’t got the time to spend being Spielberg and I’ll never finish editing it anyway. What I really should be doing is getting a crew together and entering a short film making competition. Competitive filmmaking events such as Tropfest NZ, Loading Docs and 48Hours are open to anyone, no matter your level of experience. They force filmmakers to work within a deadline and other restrictions – such as location, including a specific character, prop or line of dialogue. Usually these festivals own your copyright, and put your film up online right away, which means entering other festivals or trying to sell your film outside of that event isn’t really an option. But without the larger budget and challenging time commitment required of a funded short film these competitions can be useful to find your collective strengths and weaknesses on set. We recommend them as a training ground where you can have fun and test out ideas. Filmmaking competitions have been a fertile incubator of talent in Aotearoa New Zealand. And while their production values aren’t usually up to the standard of Show Me Shorts we have had a small number transcend their limitations for screening in our event too. The year 2016 was a benchmark year for The Downlow Concept, they filmed their first feature Gary of the Pacific – due to hit cinemas March 16th – and landed a deal to develop a show for US cable network FX. The trio, who are also behind 7 Days and Hounds, developed their comedy chops a decade ago in the 48Hours filmmaking competition. Back in 2006 they took out top prize with Brown Peril – The Tim Porch Story. Their dry Christopher Guest-style mockumentary humour is gold – as is the lead performance by 7 Days regular Josh Thompson. Proving how successful short film comepetitions are at building a cohesive filmmaking team, the Downlow group came back and won at 48Hours again in 2010 with Only Son – starring Thompson again, who also takes the lead role (his first in a feature film) in Gary of the Pacific. Filmmaking duo Nicola Peeperkoorn and Andrew Cooper are a great example of how festival competition deadlines reward those keen Kiwis willing to give it a go. After downing a few beers one night in 2014 they entered Tropfest NZ on a whim. With the deadline looming they completed the hilarious Help in six days and ended up winning the top award. This film is an amusing mockumentary about the prevalence of support groups – for increasingly strange addictions. The pair credit short film competitions like this with helping to develop their quirky sense of humour and visual style. Peeperkoorn produced the acclaimed horror short Restoration, which screened at Show Me Shorts in 2015. She and Cooper have now made four short films and two feature films. Their filmmaking competition entries are an example of the can-do/hands-on attitude prevalent in the New Zealand short film community – together tackling writing, production, direction, editing and a dash of scoring for their 2016 Tropfest NZ entry Meet Hamish. Kiwi filmmaker Allan George achieved success at TropfestNZ in 2013 with his comedic short Sounds Perfect – which went on to screen at Show Me Shorts. He was back on the Tropfest podium last year, winning third place for his true-story account of a homesick Kiwi, Lon-Done. This story is about the high expectations associated with the Kiwi O.E. tradition and what happens when they are not met. I only survived in London for 9-months so I get it! George’s Fishman 3: The Casting Tape was a Tropfest NZ finalist this year. He recently won Best Screenplay at LA Shorts Fest for his short film script, Everybody Has A Thing – a project has been shortlisted for NZFC funding. He’s a bit of a jack-of-all-trades – he writes, directs, shoots, grades, mixes and obviously gets all filming permits in London’s tourist hotspots. He’s currently directing some episodes of the NZOA-funded TV series Only in Aotearoa and writing for Shortland Street. Want more shorts? Watch all the 2017 Tropfest NZ finalist films here. 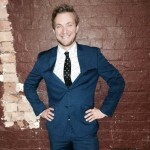 Clayton is a promo director for Sky TV, with a passion for film, sports, playing dress-ups, and all things competitive. He's part of the programming team for Show Me Shorts, and edits our trailer each year.